If you’re wondering where the devil is, I am reliably told that he is in the details. Here are some devilish details about this entry: it is the second half of an excursion I took into north central and northwestern Ohio on November 17, 2017. The reason for this excursion was to revisit some migrant farm labor housing I had discovered in the muck lands around Willard, and indeed I did revisit it, but I combined those photos from this trip with similar photos from the previous trip as a special blog entry, so I do not repeat them here. Indeed, I take up the trip just after leaving the muck lands area. 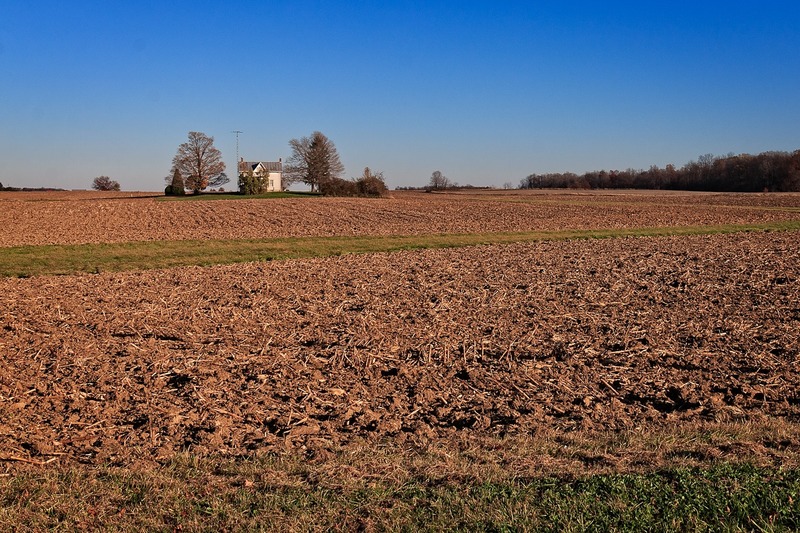 This area of Ohio is flat farmland—the stereotype many people have of Ohio who do not know that the state is also part of Appalachia. I like this photo because it is so timeless. You could imagine that you are looking into a portal at 1954. If it were not for the television aerial on the white house, stretching high to catch distant signals (that are no longer there), one could imagine that it was 1924. 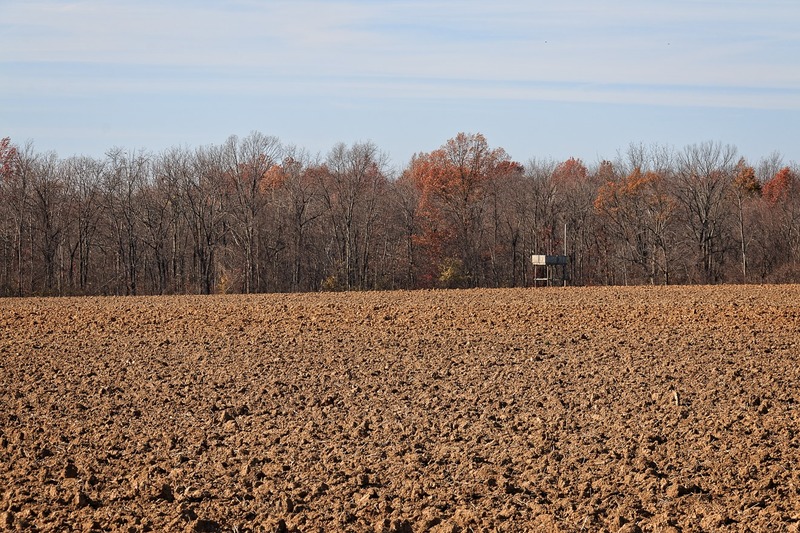 Although this whole region was once primeval forest, most of it has long since been cleared for farmland. Still, there are many patches and stretches of woods. Here someone has erected a deer stand to be able to spot (and kill) deer coming out into the open to nosh. 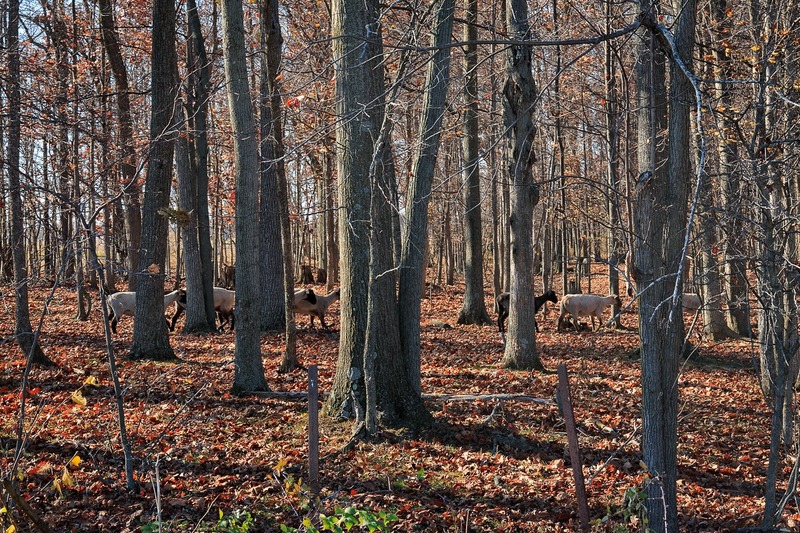 Sometimes people will let patches of woods remain around their homes, giving the homes a woodland feel, even if open fields are only a hundred or two hundred yards away. I was driving alongside one such patch when I caught movement out of the corner of my eyes and discovered a line of sheep winding their way back home in the afternoon after having spent a busy day grazing. This is the second time in my excursions that I have just suddenly had a winding line of sheep appear (I also once had a flock that had broken through a fence block the road I was on). On a whim, I decided to see what the photo would look like in black and white. 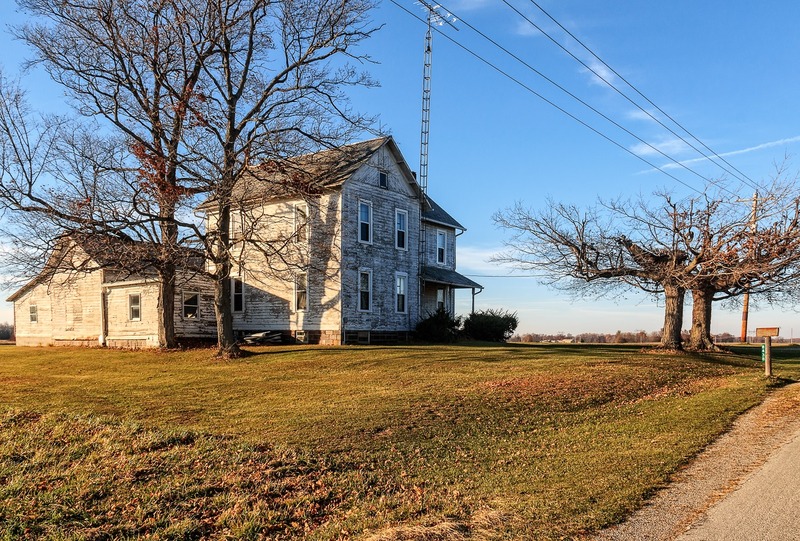 It may be an illusion, but I seem to see more abandoned houses in western Ohio than in eastern Ohio. Part of this may simply be visibility—I can see more area in wide-open western Ohio than I can amidst the hills and woods of eastern Ohio. Another factor may be related to the economics of the state. 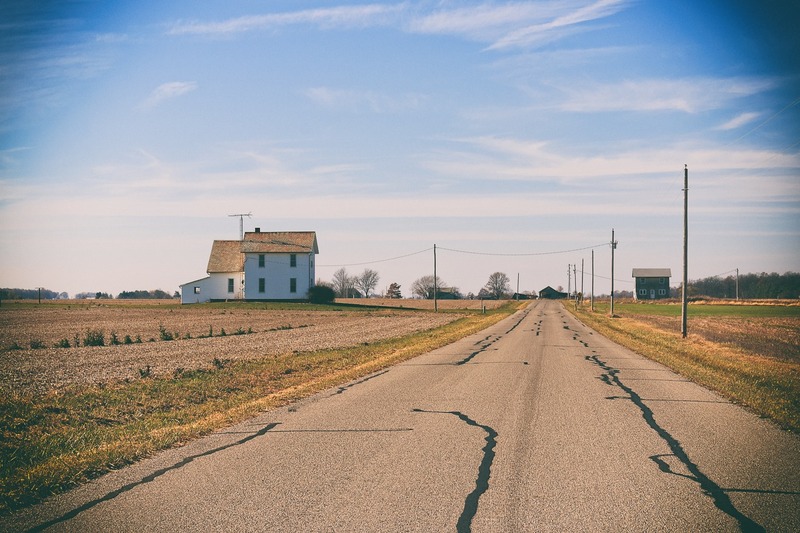 In western Ohio, more old houses were built with brick, which tends to last, while in the Appalachian regions of eastern Ohio, more houses (or shacks) were built with wood, and not as sturdily. Mobile homes are also more common in eastern Ohio, by my very subjective measurement. This old house and barn seemed to be abandoned—though, this being Ohio, someone still mows the lawn. It looks as if the barn is very near the house but that’s an illusion; there is actually considerable space between them. 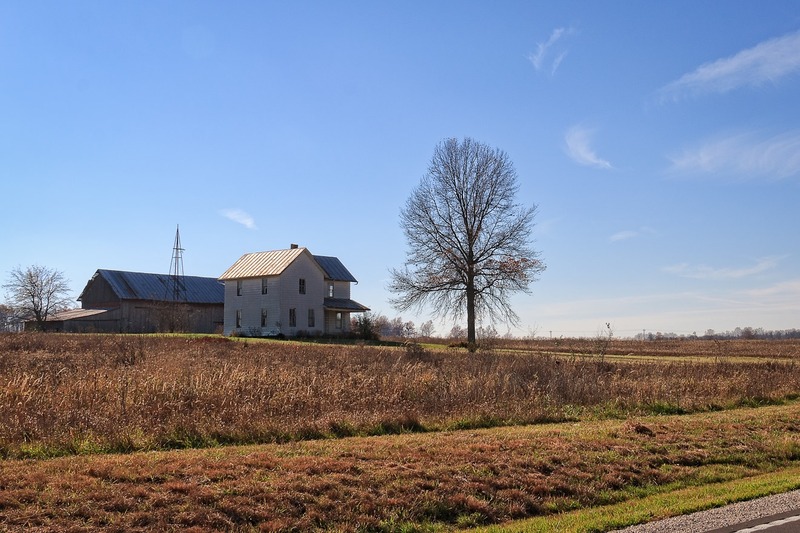 This old farmhouse was a bit east of the hamlet of Republic, Ohio, in Seneca County. Republic (population 549, salute!) was a railroad village, expanding or declining as various railroads did or did not choose to go through the town. 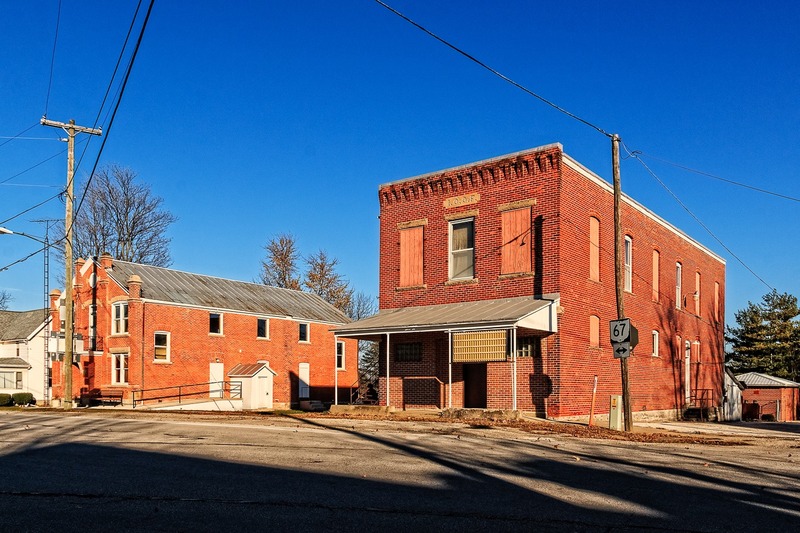 This is the first populated place I have discovered in Ohio were its earliest recorded population (or, at least, the earliest that Wikipedia reports) was actually its highest. In 1850, Republic had a population of 917. Within twenty years, that had dropped to 481, only to go back to 715 by 1880. More wild population shifts occurred in future decades as well. In 1960, Republic had 729 souls living within its bounds, but it has had pretty consistent population decline since then and it seems unlikely that some new surge will save it as it had several times in the past. Still, there’s a little life left in Republic. 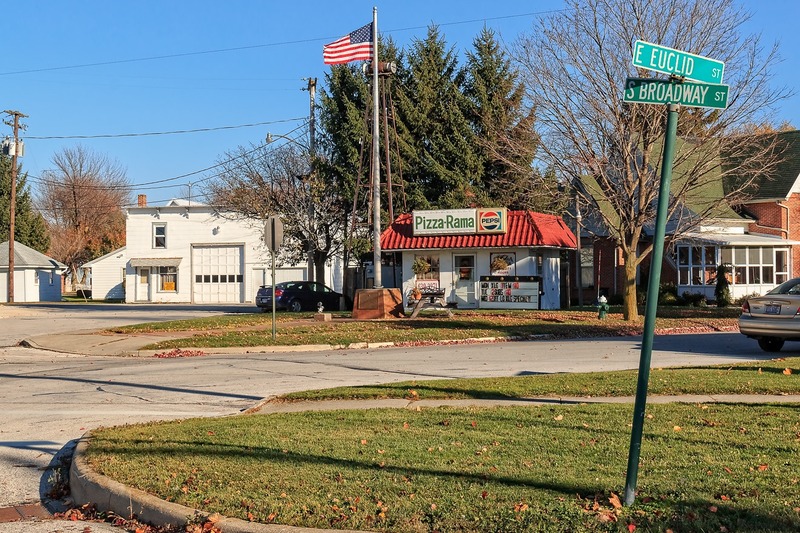 Here, on the main drag, one can find Fathead’s Restaurant (established as recently as 1994), and some sort of place that sells beer and pizza. The business at the end, however, which was once the Pancoast Furniture Company, seems gone. A reference in a Sandusky newspaper to the business mentions a “Mrs. Reginald Pancoast,” which is an amazingly hoity-toity name. I would expect a woman with that name to be a rich society widow lecturing to Groucho Marx as he tries to woo her for her money. The company incorporated in 1952. It was later purchased by another Republic resident, James J. Cool, who eventually retired and moved to Arizona (Cool died in 2011). He shuttered the business in the late 1990s and it seems that building has been vacant ever since. Northwest of Republic I came across this former one-room schoolhouse that had been repurposed into a tiny home. I’ve seen a handful of such schoolhouses that now survive as residences and it always tickles me when I find one. 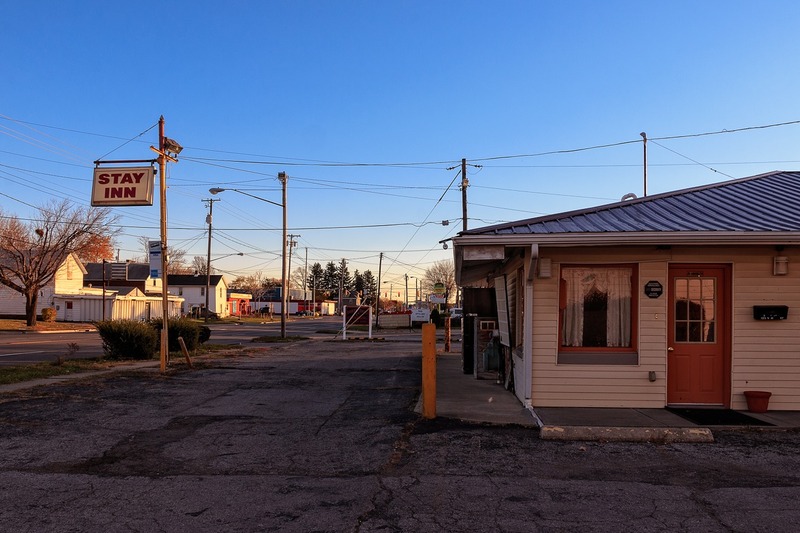 I continued north until I found myself in the town of Fremont, Ohio (population 16,374, salute! ), which was, amazingly, a town I had never been to before. It’s about 40 miles outside of Toledo and its claim to fame is that it is where Rutherford B. Hayes is from. Essentially, you can’t shake a stick in Ohio without it bouncing off of some former president or Civil War general with Ohio connections (Hayes counts as both). Rutherford B. Hayes, by the way, is one of the all-time great presidential names, a name that richly rolls off the tongue. I would like to think that Rutherford B. Hayes had an illicit affair with someone named Mrs. Reginald Pancoast. 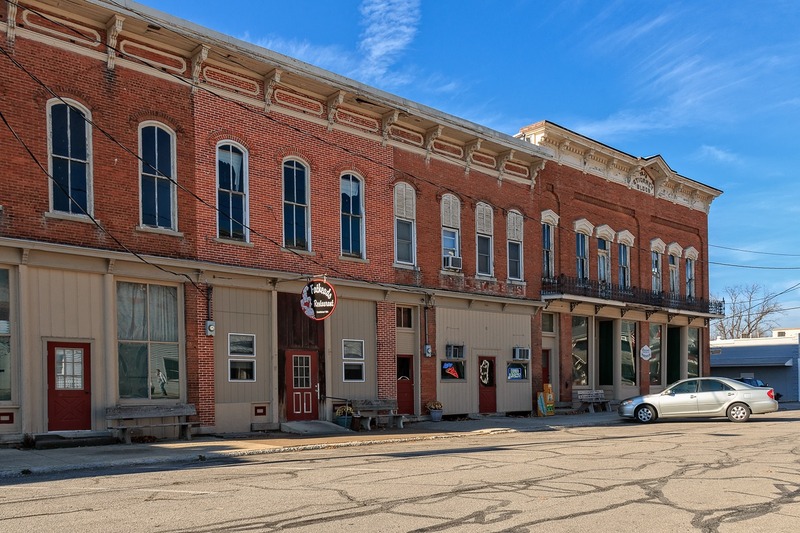 Prior to being named after Fremont, the explorer, presidential candidate and Civil War general (and a success at only one of those three), Fremont was named Lower Sandusky, which explains why Ohio has had an Upper Sandusky and a Sandusky, but not a Lower Sandusky. In my opinion, one can never have too many Sanduskies. But that’s just me. Here we see what once was Fremont’s post office, which is frankly as impressive a small town post office as I have ever seen. In 2000, an entity called Pontifex purchased the building. It’s a little odd but it seems to be some sort of Christian organization that combines sports and workout stuff with charity. For example, it includes the “Body Lines Health Club,” but also operates a food pantry. It has “showers of blessings,” which are apparently free showers for the homeless, and it has the “Little Giants Locker,” which donates uniforms to poor children. Most of the people involved with Pontifex also seem to be involved with an entity known as the New Hope Vineland Church, which seems to be into repurposing old buildings. In 2016, they purchased an old Moose Lodge building to turn into another church. Vineyard Churches are charismatic evangelical churches, with some ties to Pentecostalism, and appear to be an offshoot of the broader Apostolic Movement (which means they may believe in things ranging from the notion that people can get prophetic messages from God, as well as speaking in tongues to casting out demons). Fremont is an interesting place and worth a return visit from me. I thought this one particular old building was especially interesting, but it turned out to be very hard to photograph because of the heavy late afternoon traffic. Now home to a computer store and a consignment shop, it is a little the worse for wear, but still rather impressive. I was hoping to find out a little about the history of the building but I was not successful. Fremont seemed like a good turn-around point, so I decided to start heading south, back towards home. This took me through the village of Green Springs, Ohio (population 1,368, salute! ), which was named after a local natural sulfur spring (with green-hued water, thus the name). Like Magnetic Springs, not all that far way, Green Springs became a “health” center for the ostensibly healing qualities of the spring’s water (in those days before treatments or vaccines for conditions such as tuberculosis or polio). The spring at Green Springs, dubbed simply Mineral Springs, is claimed to be the largest natural sulfur spring in the world, flowing up in large quantities from an underground river. As with Magnetic Springs, hotels and resorts sprang up in the town, and people came for its waters, until actual medical advances rendered it all moot. Now, Green Springs is a very sleepy little place. I was taken by this tiny pizza place, both for its odd size and stand-alone nature, as well as for its name: Pizza-Rama. I was sadly unable to find much about the history of this business, but I love the name. The etymology of adding “rama” or “orama” or “arama” at the end of a word has a long history, but became particularly popularized after the Futurama Exhibit at the 1939 World’s Fair, followed by the use for a movie format, Cinerama, which inspired a huge number of copycats in the 1950s and 1960s, such as liquoramas and dine-a-ramas. Like the suffix “o-mat” (as in automat or laundromat), it has a very period feel to it. 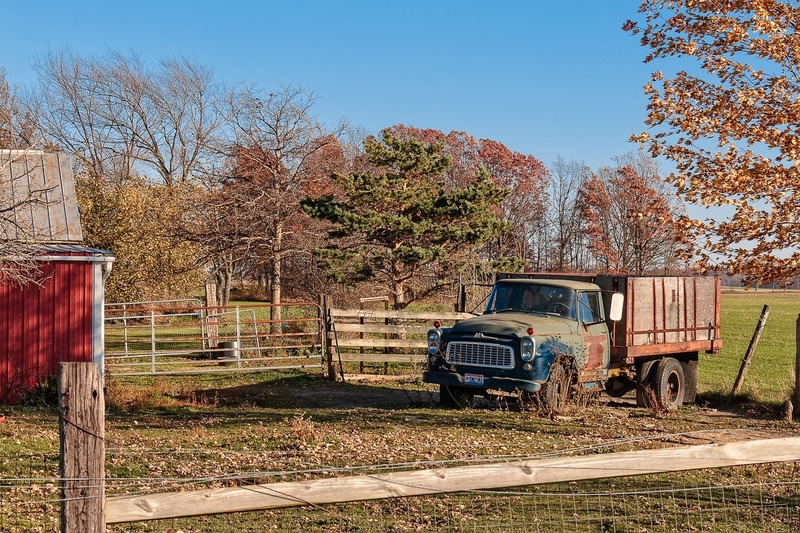 Old vehicles come with their very own period feel, as with this old truck seen on a farm west of Republic. With some difficulty, I think I was able to identify this vehicle. I think it is a 1959 International Harvester IHC B-120 4×4 flatbed. But don’t quote me on it. Southwest of Republic a bit is the tiny unincorporated hamlet of Melmore, Ohio. 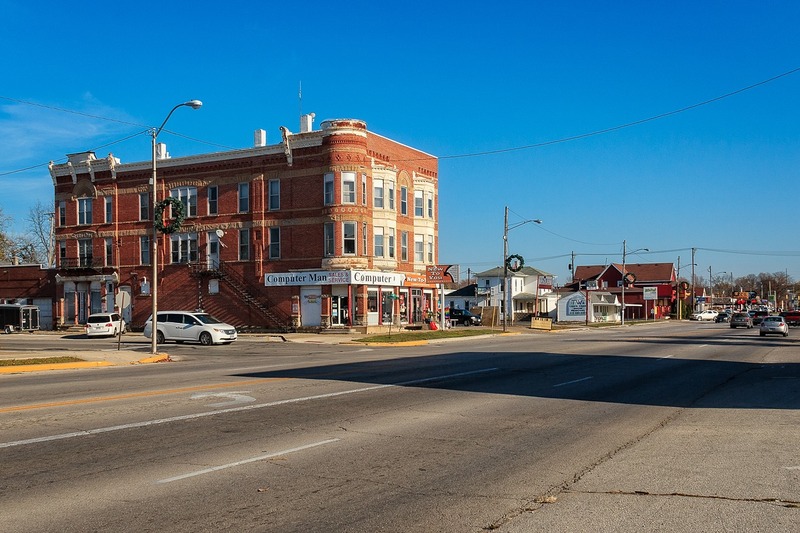 It is a “census-designated place,” which typically means that a post office is or was located there (in this case, was; the post office closed in 1993). In 1880, Melmore had a population of around 200; it could be less than that now. 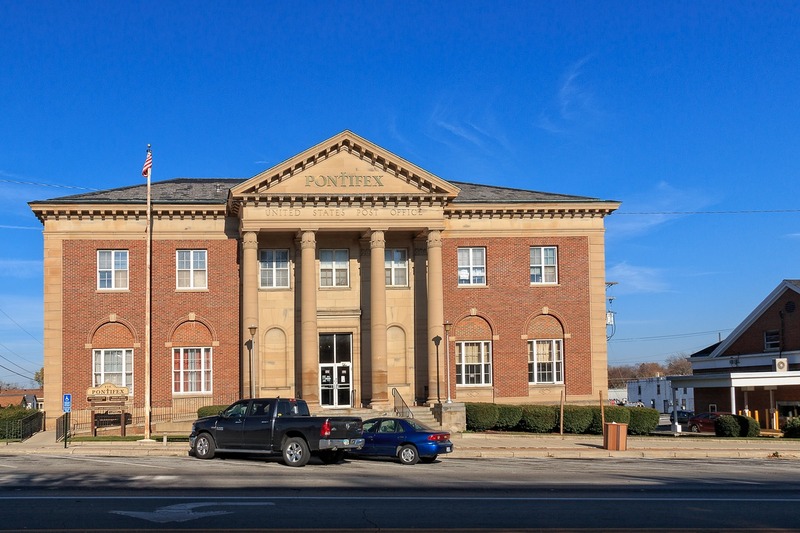 At one point it was, nevertheless, large enough to sport at least one fraternal lodge, for this is the former Independent Order of Odd Fellows lodge building. Here is a little farm cottage, across a distant empty field, with an obsolete television aerial that is twice as high as the cottage itself. I remember as a kid in the 70s going to the farmhouse of my great uncle, about 30 miles outside of El Paso, and seeing how grainy and snowy the television reception was. I wonder how it was out here, even with such a tall aerial. A little further down the road I found this abandoned but regular-size farmhouse, with its own massive television aerial. 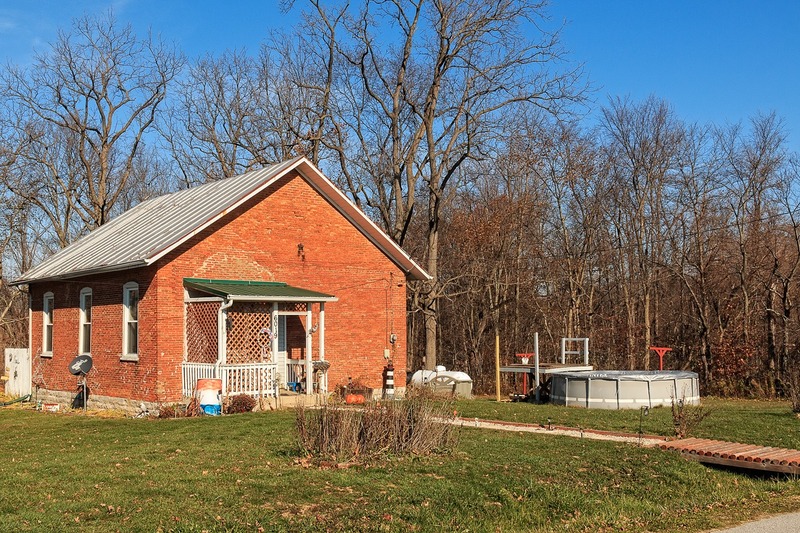 With setups like these, it is easy to see how satellite dishes (even the huge early ones) became a popular feature for many in rural America in the 1980s. 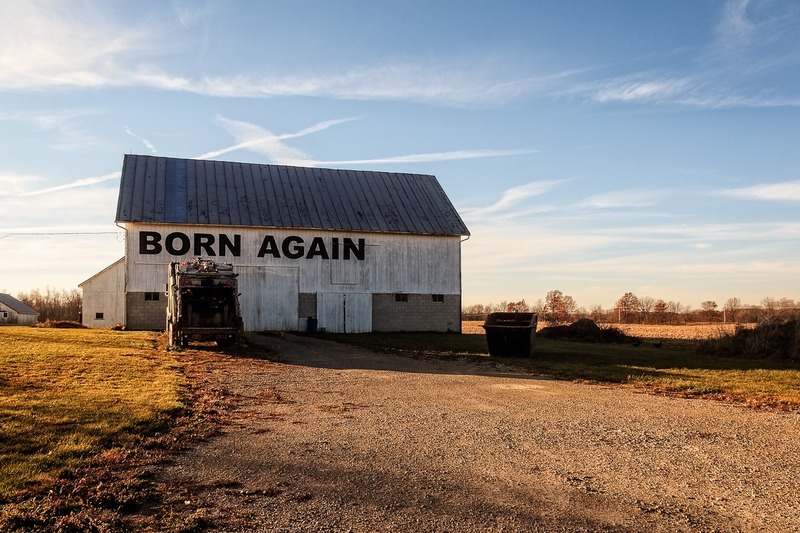 I found this barn a bit east of Nevada, Ohio—and now you see why this blog is titled and opened the way it is, if you still remembered it at all—which I thought was a bit of an in-your-face profession of faith. At least it didn’t read “Born Again, Losers!” but you still get that “all caps” sense of someone shouting at you. As I headed south, I found myself in Marion, Ohio. I was no longer really in the photo-taking mindframe by this point in time; more in the get-home-and-put-a-frozen-pizza-in-the-oven mindframe, but I made an exception for this sign for the “Stay Inn.” Perhaps it’s just best to say that Internet reviews of this establishment are not very kind to it. 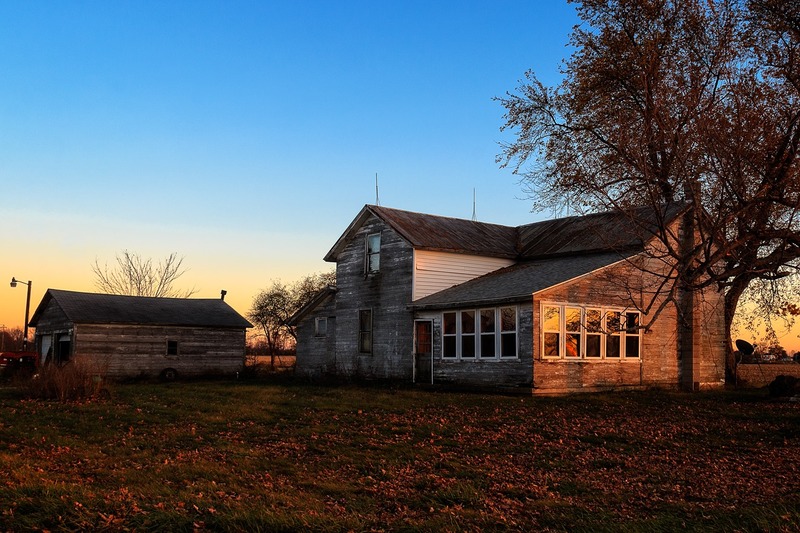 With this last final photo of a farmhouse, I’ll sign off for now. I may not be born again but I also wasn’t born yesterday and I know when to quit. See you ASLOK next week. I too take a lot of pictures. I can’t take time to go on the photo excursion this year. Let’s talk about next year when I can probably arrange my time a little better. Your narrative that goes with excursion 64 Part 2 is neat. Wish I could write that well.